"...Overall, even though a bunch of things happen, when it's all over, it feels like nothing happened at all. The dancing and singing is incredible, but I didn't sign up for a dance showcase or a concert, I wanted to see musical theater. Though Old Deuteronomy sings in the final song, "The Ad-dressing of Cats": "You've heard of several kinds of cat/And my opinion now is that/You should need no interpreter/To understand our character," only the first part is true. The second part of that lyric is not at all. None of these cats developed further than their introductions. As Grizabella sings, "When the dawn comes/Tonight will be a memory too," and sadly that couldn't come soon enough." "...But the greatest disappointment is Old Deuteronomy (Brandon Michael Nase), the clowder 's wise elder. Nase has a lovely voice, but it's more ideal for playing a young romantic lead. Where is the gravitas here? Unhelpfully, he's clad in shag carpeting, and his face looks like it's taped over with beards borrowed from the nearby Hollywood High School's drama department. (Actually, the school would probably never let an actor go onstage looking like this.)" 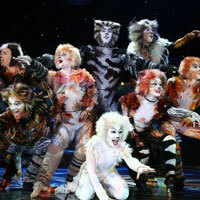 "...CATS is at its best when the dancing takes over and carries the audience away to a whimsical world where a tire rising out of a junkyard becomes a space ship headed to another life, a string of lights is all that's needed to beckon us into a moonlight ball, and the sound of breaking glass signals a hidden villain on the loose. Who knows when you'll be invited to this kind of fantastical party again." "...If I had my way, the slogan for Cats would be changed from �Now and Forever� to �Not Now, Not Ever.� Even when I saw the show back in the early 80s and again in the early 90s, I simply couldn�t make it through another act and bolted at intermission. After seeing the national tour at the Hollywood Pantages last week, I can understand why I did what I did. With some fun melodies by Andrew Lloyd Weber, some may call it a musical, but it�s really a song cycle wherein T.S. Eliot�s poetry is stuffed into bars of music where they don�t often belong. A nuisance of cats are gathering for some kind of alley party to decide which cat among them deserves reincarnation; they introduce themselves to us; then an old puss who we don�t know will use up her ninth life and float up to the feline firmament. The end. It�s near impossible to understand what the hell is going on." "...Throughout the show the singing and dancing never ends and is nothing short of spectacular. But to attempt to fully explain each twist and turn in this extraordinary play would be like trying to explain the meaning of life in 25 words or less."